When pressure differences alone are responsible for moving air, the air—or wind—will be pushed in a straight path. For example, if someone opens a door into an enclosed space containing a different air pressure, they will feel a rush of air when the door is opened and the air travels from higher pressure to lower pressure. 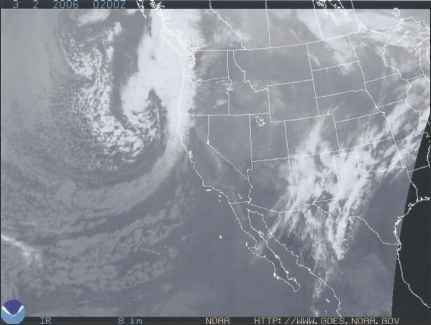 It may seem odd when looking at satellite weather maps to see that large storm clouds move in circular patterns. Winds do follow curved paths across the Earth. Named after the scientist who discovered this effect, Gustave-Gaspard de Coriolis, this phenomenon is called the Coriolis force. The Coriolis force is an apparent drifting sideways (deflection) of a freely moving object as seen by an observer on Earth. 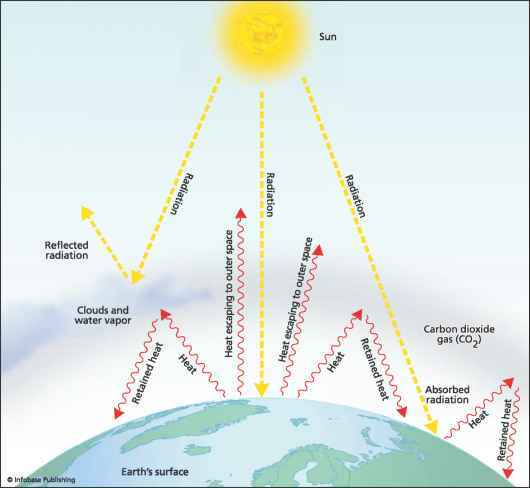 It is the tendency for any moving body on or above the Earth's surface, such as an ocean current, an air mass, or a ballistic missile, to drift sideways from its course because of the Earth's rotation underneath. In other words, a moving object appears to veer from its original path. In the Northern Hemisphere, the deflection is to the right of the motion; in the Southern Hemisphere, it is to the left. at lower latitudes. Similarly, a body traveling toward either the North or South Pole veers eastward because it retains the greater eastward rotational speed of the lower latitudes as it passes over the more slowly rotating Earth closer to the pole. The practical applications of the Coriolis force are important when calculating terrestrial wind systems and ocean currents. Scientists studying the weather, ocean dynamics, and other related Earth phenomena must take the Coriolis force into account. The Coriolis force is the reason that tropical storms or cyclones rotate counterclockwise in the Northern Hemisphere (called hurricanes) and clockwise in the Southern Hemisphere (called typhoons). The reason why a hurricane does not form on the equator is because the equator has the weakest Coriolis force. A hurricane forms just to the north of the equator and generally heads northwest if not interfered with by other winds or pressures. It is also the Coriolis force that affects dominant wind patterns, such as the westerlies, easterlies, horse lati tudes, and equatorial doldrums. The Coriolis also affects regional and global weather patterns because it interacts with the jet streams.